I hope you are all well. What is happening with the weather here in the UK? Last week on a couple of occasions I actually took the dogs out for a walk without a coat!! This week I am having to not only wear my coat, but early morning it's gloves as well! 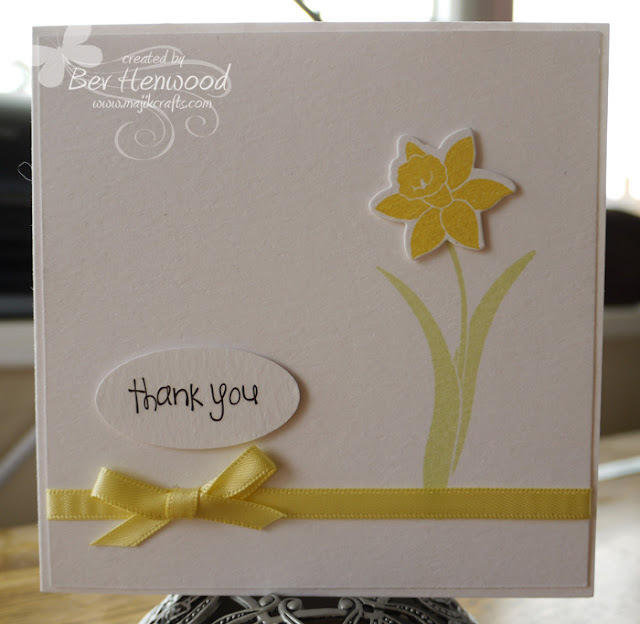 Today I have another Thank You card to share ~ this one uses the gorgeous stamp and die from Clearly Besotted Stamps a relatively new company here in the UK, but the products are fabulous, the stamps are fantastic quality and there is now a growing selection of dies to match ~ whoo hoo! Thank you so much for stopping by and for any comments you may leave ~ I love reading them. I hope you are all well and had a lovely weekend ~ wasn't the weather here in the UK gorgeous! We went on our first Beardie ramble of 2013 yesterday in the beautiful village of Ilmington, the weather was perfect and we all ended up in one of the village's pubs afterwards for a lovely lunch ~ see photo below. 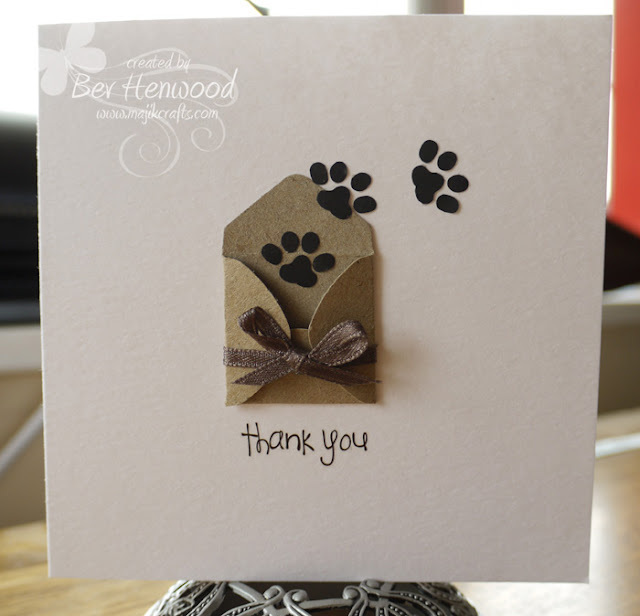 My card for todays share is one that Bailey Beardie sent to my Mom to say thank you for his Birthday card and money (see I bought them all up right and polite) ~ lol. 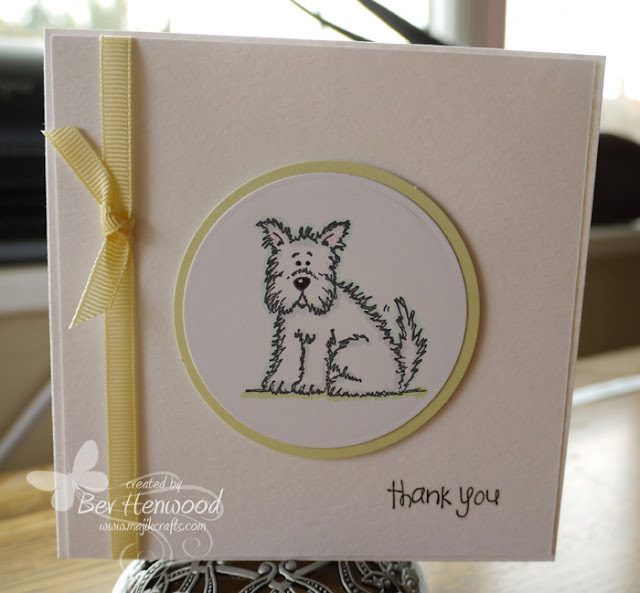 I didn't share his Birthday card on my blog (his Birthday was 31st March) because I wasn't that pleased with it and when I photographed it I decided I didn't like it at all ~ poor dog! Now, I have to own up to this not being my design entirely ~ I made so many cards in March my mojo had packed its bags and taken itself on a Spring break, so I saw THIS card by Christine on her blog (I don't seem to be able to link in directly to the card but it was posted on the 26th March 2013 if you want to take a look) and it gave me an idea ~ especially when I remembered that I had the envelope punch lurking somewhere gathering dust. 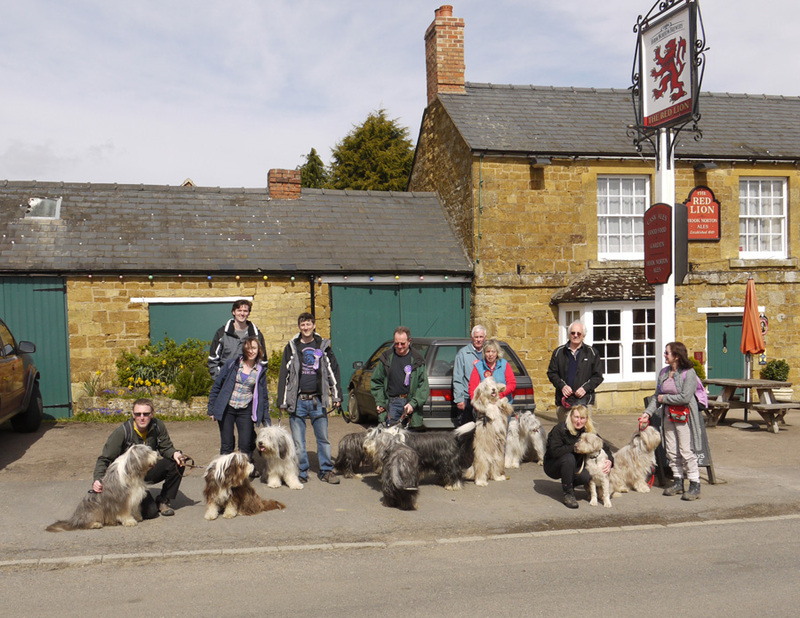 Now as promised a photo of all us Beardie people outside the pub in Ilmington. Thank you for visiting my little blog I do appreciate it and love to read all your comments if you wish to leave any. I hope you are all well and enjoying what looks suspiciously like Spring weather. I have a quick share today a Thank You card. This is a very simple card for someone who owns a Westie. Sorry it's such a quick one today, but have loads of chores to get done. Thank you for all your lovely comments I do enjoy reading them all. Dare I say it ~ I think Spring has finally sprung! We had glorious sunshine here in Warwickshire over the weekend and that awful biting cold wind has finally disappeared. Today I have a card that I made for my Hubby for our Wedding Anniversary which was towards the end of last month. That's me done for today ~ looking forward to the next episode of Broadchurch tonight ~ I'm totally hooked! 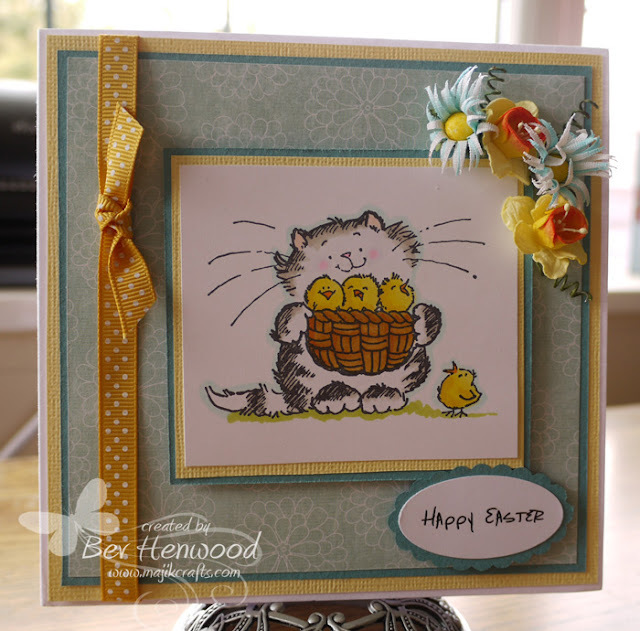 As I mentioned in my previous post I have two Easter cards to share with you ~ belatedly! We were in North Wales over the Easter weekend and had a thoroughly nice time too ~ we are not go-away people, preferring our own company and home ~ besides with three dogs there are not many places we can land ourselves (the dogs don't do kennels) ~ but staying with my Dad and Stepmom was great and the dogs loved walkies on the beach. So, here is card number two made for my Dad and Stepmom. 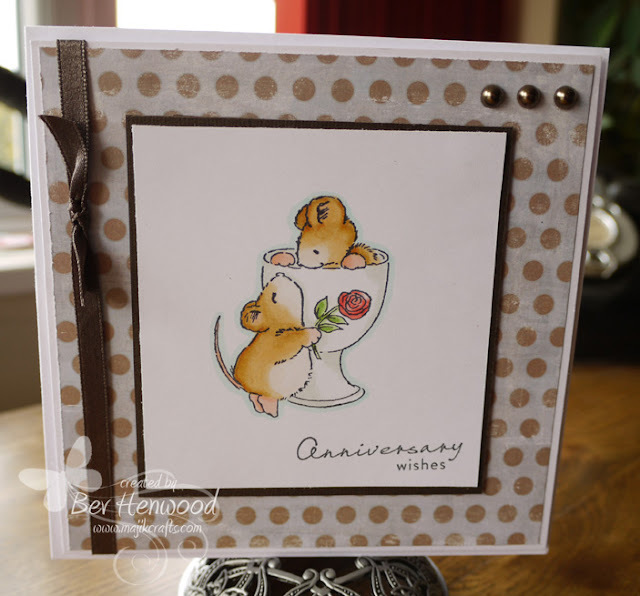 As you can see, it is a variation on the previous card, just made in a different colour way. Thank you for stopping by and enjoy the rest of your day. Firstly many thanks for all your lovely comments ~ I love reading them and thoroughly appreciate the time you all take out to comment ~ I know how precious time is. 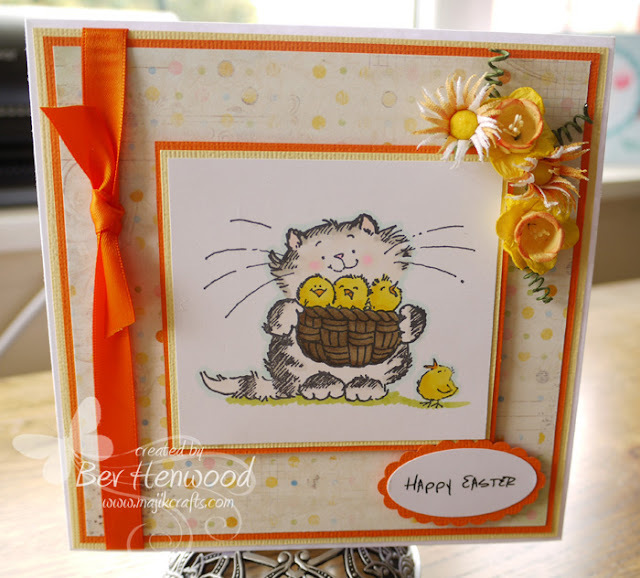 Today I am sharing two Easter cards that I made ~ I know I am late, but we were away at Easter and not being blog savvy I hadn't scheduled a post to coincide with Easter itself! This is the first card ~ made for my Mom.